Don't Have An Account? Sign up for a free, 30-day trial. Join now, and in a few minutes, you will have access to the most comprehensive library of investment documents. 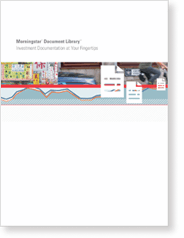 The Morningstar Document Library is a comprehensive resource for investment documents, from prospectuses to annual reports. By combining more than 20 years of data collection experience with advanced technology, Morningstar delivers accurate and timely documents to clients, enabling them to meet regulatory requirements as well as deliver excellent service to investors. Morningstar's scalable global infrastructure is designed for performance, resilience and high availability. This infrastructure manages 22 online products, including Morningstar.com, which handles peak loads of three million page views per day. With locations in Chicago, London, Shenzhen, and Sydney, our worldwide data centers ensure 24*7 business continuity for all of Morningstar's global users. The Morningstar Document Library is ideal for brokerage firms or retirement plan service providers that want to outsource costly document collection and maintenance. In addition to this web interface, the Document Library can also be private-labeled or provided through APIs. Advisors and plan providers can grant investors direct access to the library via their own websites, ensuring investors receive immediate access to key documents. Fund companies and compliance officers find it a valuable resource for current and archived proprietary and competitor filings. © Copyright 2019 Morningstar, Inc. All rights reserved. Please read our Legal Notices.